The flat. I’m not feeling it. Not yet anyway. I’ve let the Guineas and the Dante go with barely a ripple in my Bet365 vat. So maybe I’ll indulge in a little look back over the completed jumps season before the need to thrash around in the nether regions of the Carnarvon Stakes formbook takes hold of me. The Punchestown Festival is technically the first big meeting of each new jump season. For all practical purposes, of course, it is the final monster meeting of the old one. Punchestown’s five days of top quality Grade 1 action, competitive handicaps and a bottomless well of bumpers became yet another stage for the Willie Mullins showcase. A Festival he has plundered with ease in previous renewals, this season his dominance hit new heights and crowned a majestic season. These are easy words to tap out on a tired old laptop. What do such glib phrases mean? 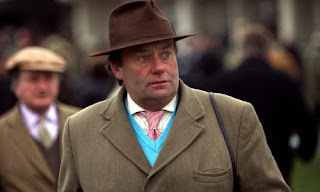 For starters, he banked €4.2m in prize money and handled 187 winners in Ireland. More than twice the number of his nearest rival. The strike rate was a jaw-dropping 34%. Given the short prices at which many of his stable stars plunder their races, it is even more remarkable that Mullins shows a 41.5 point profit to a level £1 stake. Uncompetitive events and shallow pools, I hear you mutter. Well, over this side of the sea the Mullins juggernaut picked up just shy of £1.4m to finish 4th in the trainers table with 16 winners from 91 entries. I haven’t finished yet. If there was any doubt that this was his best season ever, the stable landed 30, that’s thirty, Grade 1s in Britain (8) and Ireland (22) during 14-15 (including last week’s Punchestown meeting). During the same period for 13-14, he snaffled a mere 19. Even without a stat attack, the casual observer would be struck by Mullins’ barely credible strength in depth, which now extends across all the jumps divisions. Where once he was weaker in the staying chase department, we now see a nap hand of potential Gold Cup winners. Keeping them apart will be his challenge, though with some of his front rank in the ownership of Gigginstown who don’t mind pitching their beasts against each other, there is more prospect of some juicy clashes. Combination Quinteta anyone? Has Fred Done invented the Tote bet yet? I might have a saver on Don Cossack though. For me, the most improved horse in training this season. What a campaign the horse has had, navigated beautifully by the gifted Gordon Elliott. 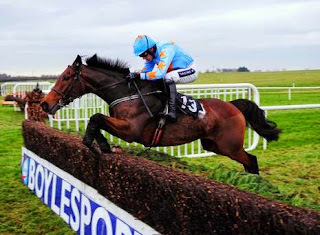 And capped with a rare Mullins party spoiler in the Punchestown Gold Cup. 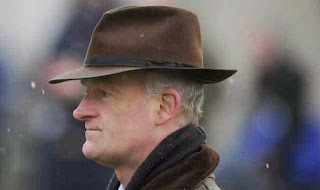 In truth Cheltenham may not be the Don’s ideal track, but the point about the strength of Irish racing is writ large. It seems set only to get better. It puts into perspective the achievements of Paul Nicholls. He ran away with the British trainers championship and put together a season-long series of big Saturday winners. He had few answers when the best Irish horses came out to play, though. Silviniaco Conti kept the flag flying everywhere except Cheltenham and Dodging Bullets, somewhat surprisingly, came to the fore in a sub-standard Queen Mother Champion Chase. As ever, he has a few good ones to look forward to next term. Mildmay winner Saphir Du Reu and Coral Cup winner Aux Ptits Soins would be close to the top of the list. I still like Paul Nicholls. He is one of the trainers that tries to be honest about his stable. Everything he says is under intense scrutiny and he gets lambasted if he’s too bullish about the chances of a horse. Understandable if he shows a bit of irritation now and again. Better his enthusiasm than the smoke and mirrors of the Nicky Henderson operation. He looks shattered these days. A trainer whose nervous disposition sees him increasingly reluctant to actually run his horses. He’s more florid and heavy lidded than ever. All his interviews seem to end in damp-eyed sentimental jibberish. Maybe the burden of hosting a superstar like Sprinter Sacre has taken its toll. Time to step aside? Not that he could ever do so with the total, unalloyed respect that accompanied the retirement of AP McCoy. This blog has paid tribute to The Champ on more occasions than one. He leaves a massive hole in the punter’s armoury. His are boots that Dickie Johnson, Tom Scudamore and the like will never fill. Sandown’s old Whitbread Gold Cup meeting was the last day of the domestic jumps season and they conspired with Channel 4 to play up the retirement of McCoy to full effect: guards of honour, Champion Jockey presentation, family photos, interviews… Only a fairytale last day winner was missing. Other awards were dished out at Sandown too. 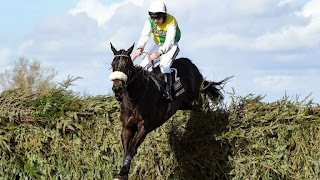 Many Clouds garnered the accolade of British Jump Racing Horse of the Year. I have absolutely no complaints about this. He was a firm favourite of mine long before his breathtaking Grand National victory. That Aintree performance put him in to a different league. The winning time of 8 minutes 56.8 seconds was the second fastest in the race's history. And no horse has carried a higher weight to victory since Red Rum in 1974. He is also the first horse to win both the Hennessy Gold Cup and Grand National in the same season. I backed him in the former and then abandoned him for the Grand National, calculating that after his disappointing Gold Cup effort, he couldn’t lump 11s 9lb to win the world’s most famous steeplechase. I was wrong. How he loved those fences! Many Clouds was in my 40 to follow last season. I wish I’d stuck with him this term. More precisely, if I’d stuck with the full 40 horse stable from 2013-14 I would have done better than this. Apart from the Sherwood star, Jezki, Annacotty, Carole’s Spirit, and Le Reve all had double figure and/or handsome multiple wins all season. As it was, I just about scraped a profit with this season selections – a measly £35 gain on a turnover of £550-odd. Worth the effort? Well, yeah. I still love fretting about all this stuff. And I beat my Bruv in our family challenge, so that’s something isn’t it? Outside the 40TF, tiny profits about summarise the rest of my punting season too. A few quid at Cheltenham, better at Aintree, wipe out at Punchestown. It has been tough going this campaign. There have been some personal highlights though. A return to Catterick races after 25 years was a lovely experience and a first ever visit to Aintree’s Grand National meeting was a massive thrill. So much to look forward to in the coming season. It will be interesting to see whether the BHA’s new Comprehensive Review of Jump Racing will have any short term impacts. The review got underway a month ago and has a remit to “assess the health of the sport, identify challenges and deliver recommendations to safeguard future of the code and deliver growth.” No small task then. The panel will look at the race programme, field sizes, breeding and prize money, with grass roots and middle tiers a particular focus. The BHA comes in for a fair amount of stick in an average season, but I applaud the review, or at least aspects of it. The jumps race programme, prize money and field sizes have long been a problem. The dominance of Cheltenham and its impact on the rest of the season is part of this. It is a structural issue that a bit of extra prize money won’t be enough to fix. Though increasing it would help. As it would with the decline of jump racing in the north. Just mentioning Michael Dickinson earlier in this blog simultaneously quickened my pulse and sparked regret. The glory days of northern racing are long over. Even recent bright spots have been snuffed out. Ferdy Murphy has successfully relocated to France, Nicky Richards remains a low key trainer, Donald McCain has lost his mojo, and O’Meara and Fahey barely bother with the jumps game these days. The contrast with flat fortunes in the north as exemplified by these last two could not be more stark. Ironically, Donald McCain is one of the committee members. His sage views would be very interesting to hear. The membership runs to 20 souls (just two women!) from betting, journalism, broadcast media, training, horse ownership, track ownership and the BHA. I couldn’t obviously see anyone who represented the punter’s view, unless that is considered to be the role of Lee Mottershead, the Racing Post representative.